Buggies and Babies Blog: Happy Halloween! My DIY Costume! Happy Halloween! My DIY Costume! 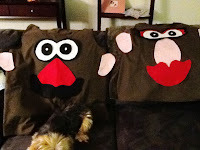 For hubby and me, we will be Mr and Mrs Potato Head. Since, I’m 5 months preggo being Mr and Mrs Potato Head seems much more comfortable than doing Ken and Barbie. Anyhow, to save money I decided to make our own costumes. I figured it couldn’t be too hard for me to sew the brown “potato” dress, and the cut outs could also easily be traced and copied. Well, here are the results – our costumes didn’t turn out to bad, right?? I’m excited I finished them – in one day too! It helped big time that my brother is a great artist who helped me trace out the face parts.